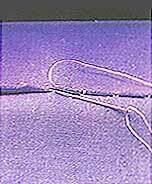 Running Stitch - Take several running stitches onto the needle before pulling it through fabric. Secure end of stitching with a backstitch (opposite). Short, even stitches of 1/4" (6 mm) give close control. Uneven basting, which combines a long stitch of 1/2" (1.3 cm) and a short stitch, can be used for straight or slightly curved seams. 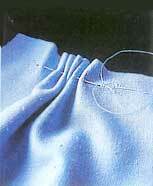 Backstitch - Bring needle and thread through fabric to upper side. Insert needle 1/16" to 1/8" (1.5 to 3 mm) behind the point where thread came out. Bring needle forward and out the same distance in front of that point. Continue inserting and bringing up needle half a stitch length behind and in front of previous stitch. Stitches on underside will be twice as long as those on upper side. 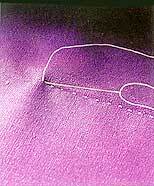 Prickstitch - Bring needle and thread through fabric to upper side. Insert needle through the fabric, one or two fabric threads behind point where thread came out. Bring needle up 1/8" to 1/4" (3 to 6 mm) in front of the point where the thread emerged. The top surface stitches should be very small "pricks". Catchstitch - Work from left to right with needle pointing left. 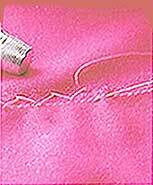 Take a small horizontal stitch in hem edge. Take another small horizontal stitch in garment, about 1/4" (6 mm) to the right of first stitch, crossing the stitches. Alternate stitches in a zigzag pattern. Work the blind catchstitch like the blindstitch, folding hem away from you. Blindstitch - Work from right to left with needle pointing left. Roll hem edge back about 1/4" (6 mm). Take a very small horizontal stitch in the garment. 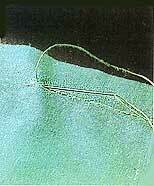 Take the next stitch in the hem, 1/4" to 1/2" (6 mm to 1.3 cm) to the left of first stitch. Continue alternating stitches. 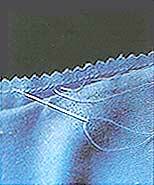 Be careful to keep the stitches in the garment side very small, and do not pull too tightly.